A digger was stolen from a construction site and used to wreck a children's playground nearby, police have said. 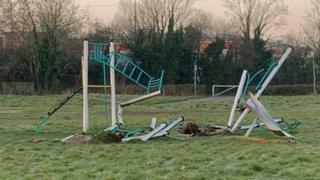 Residents alerted police after they spotted a group of youths using the JCB to demolish a climbing frame and goalposts at Black Ash Park in Newport. Gwent Police said officers turned up only to find the culprits had fled after leaving a trail of destruction. Councillor Alan Morris said it would be young people who suffer as there were "precious few" facilities in the area. An appeal for witnesses has been made.